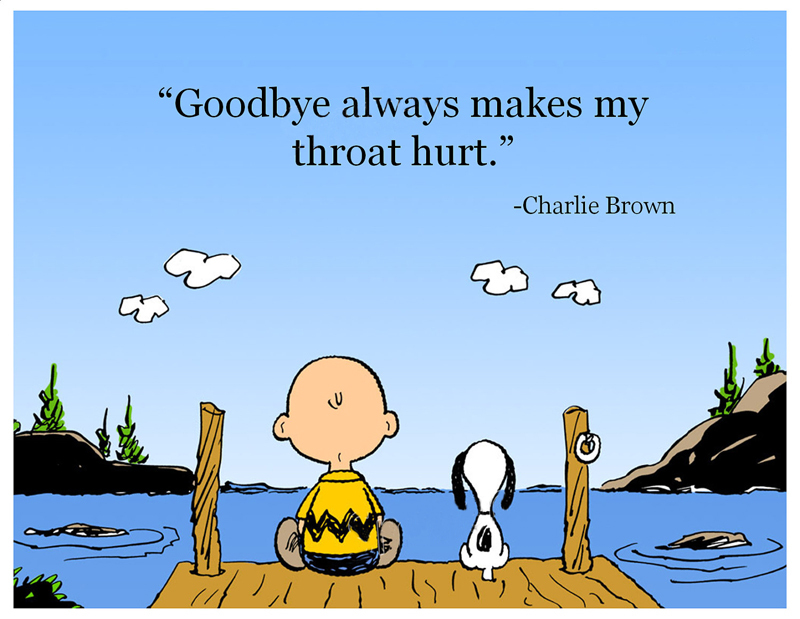 Best inspirational wishes, sad and funny farewell quotes and goodbye messages for friends. Saying goodbye or sending goodbye messages to a friend is very hard when he/she means a lot to you and it could be tougher when you don’t know if you are ever going to meet again or not. You might be depressed about your best friends farewell and only memories of your beloved friend are left behind. Don’t be so upset because the distance of thousand miles can’t reduce the bond of true friendship. Here we brought to you some of the best heartfelt goodbye messages for friends which can express the deep feelings of your heart about going away from your best friend. Dear, take a look through these goodbye messages for friends that could explain the true meaning of saying goodbye to a best friend. Inform them that you will miss him/her though how far the go away from you and your friendship will remain green forever. Our friendship has taken me on a magical journey which will never come to an end. Even though you are going away, we will never stop being friends. Goodbye. 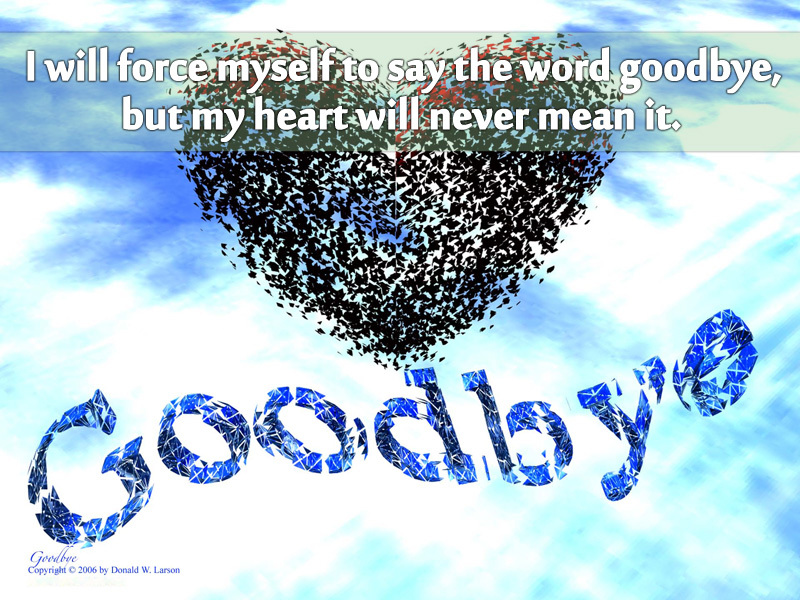 I will force myself to say the word goodbye, but my heart will never mean it. Goodbye. Saying goodbye is tough but still not as painful as desperately hoping that destiny will bring us back together again. Farewell. When best friends say goodbye to each other, what they are really saying is ‘Hold that thought, I will be back soon’ So I will hold my thought until you return to hear the rest. 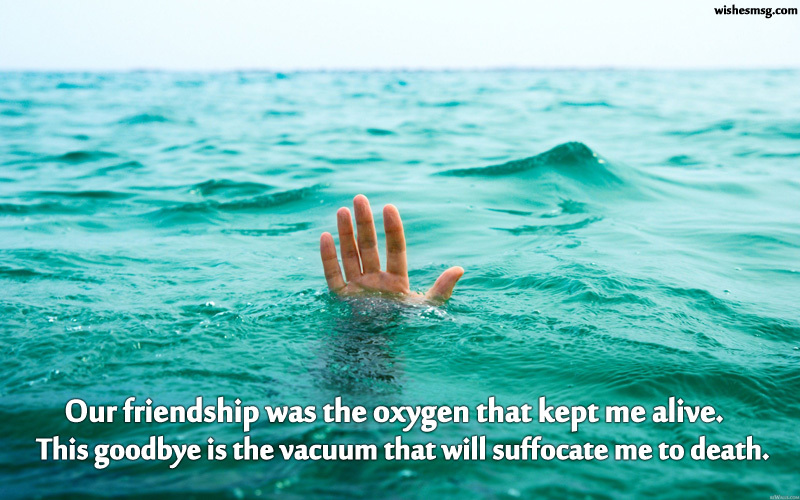 Our friendship was the oxygen that kept me alive. This goodbye is the vacuum that will suffocate me to death. Farewell. Taking you for granted, sometimes I’ve made you do things you didn’t want to. But all I want you to remember is that no one can be my best friend except you. Goodbye. Our last hug may feel warm but your absence will leave my heart shivering in a cold abyss. Goodbye. If lovers can be in long distance relationships with each other, why can’t we be in a long distance friendship? Goodbye and cheers. 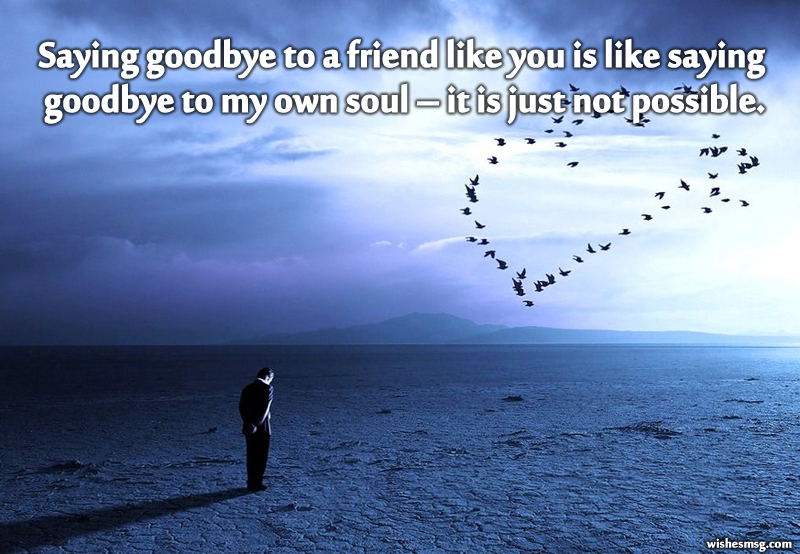 Saying goodbye to a friend like you is like saying goodbye to my own soul – it is just not possible. The only reason I am happy saying goodbye is that I know that life will find a way to bring us back together again. Farewell. I’ll silently stand in the corner and cry, on this fateful day. I refuse to say goodbye because I don’t want to see you go away. Dear friend, I don’t want you to leave, I refuse to say goodbye. I will just watch you walk away while my heart silently weeps and cries. How can I say goodbye to a friend who I can’t live without? I will suffer in silence but my heart will scream and shout. The hundreds of friends on Facebook and Twitter mean nothing to me in any way, if I don’t have real friends like you to meet every day. Goodbye. Don’t expect me to come to the airport to see you off when you leave. I will be in my room, crying on my loneliness’ eve. Goodbye. This goodbye is just a test of our friendship. Let’s promise each other that distance and time won’t come in the way of our beautiful relationship. Goodbye. The world will come to an end, as I say goodbye to my friend. But I know I’ll pull through this pain, because I know we’ll meet again. Goodbye. 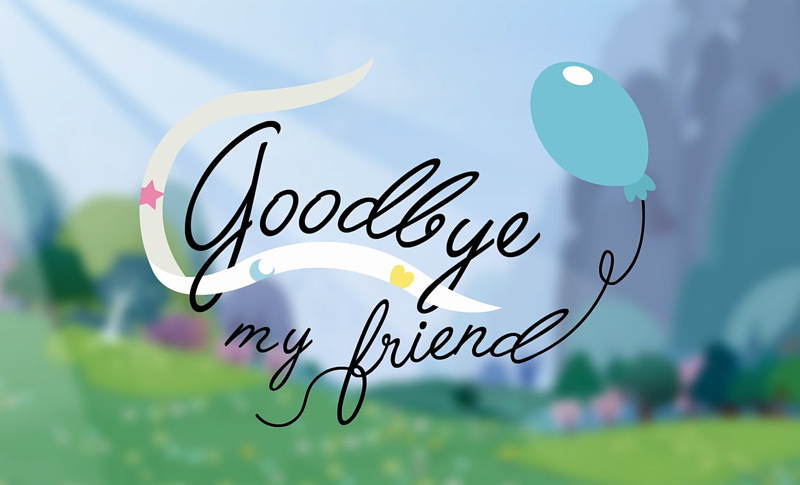 Since true friends never really say goodbye to each other, please treat this goodbye message as a mere formality and delete is as soon as you have read it. The only reason I am saying goodbye is so that I can get a chance to say hello again. The absence of a friend is going to make me feel lonely and frustrated. There is nothing good about goodbye, it makes me feel lonely and suffocated. Life and destiny can steal my best friend away from me but nothing can take away the precious memories. Goodbye my friend. I would have never said hello to you many years ago, if I knew that saying goodbye would be so traumatic. Bye buddy, I will miss you. I never knew that saying just one word could make me feel so blue, until I said GOODBYE to a special friend like you. It is easy to become friends, difficult to remain friends and hardest to say goodbye to a friend. Sorry, but I cannot do the hardest part. Sorry, for all the times I may have unknowingly hurt your feelings and caused you pain. Goodbye my friend, until we meet again. I thought 160 characters would be too less for a goodbye tweet on Twitter. But the thought of living without my best friend has left me speechless. Goodbye. Everything in my life was perfect, until it all suddenly came crashing down. I may smile while saying goodbye but your absence will put on my face, a permanent frown. Goodbye. Even though you are going away you will still be a core part of my everyday life. First I used to hang out with you all the time, and now I will miss you all the time. Goodbye. When I say that bidding you farewell is easy, take it as a compliment. Because it shows how blindly I trust you when you say that you will come back soon. Bye, my friend. All the beautiful memories that we have made together as friends will be cherished and fondly remembered. I guess we have a lot to keep ourselves busy with until we meet again. Goodbye my friend. My heart is breaking into pieces as I see you leave. I hope you are happy that you have made me cry. You have no idea how much I am going to miss you. My life will sink into loneliness with this goodbye. Just like how you don’t forget the tune when a song fades out and stops playing, I will never forget the priceless memories of our friendship even though you are going away. Goodbye. Fights, girlfriends, boyfriends, arguments, lies – Nothing has ever come between our strong friendship. So a few hundred miles is not going to make any difference either. We are friends forever. Goodbye. While seeing you off I may have a smile on my face, but after you leave I will be in a lonely place. My facade might be cheerful and happy, but deep down inside I will be suffering in agony. Goodbye. When the sun says goodbye to earth, it leaves a beautiful sunset as a gift. When friends say goodbye to each other, they leave mementos of everlasting and priceless memories. Goodbye my friend, I will miss you. With the wind in our hair and the sun in our eyes, we cherished our friendship as life’s greatest prize. Now that you are going away my life will cease, I will blissfully drown in all the beautiful memories. Goodbye. I feel sick, I feel low, I feel depressed and I feel sad – when I think about how I will miss you real bad. I feel miserable, I feel unwell, I feel down and I feel lonely – when I think about how life will be without my bestie. Goodbye. Our friendship is the best thing that has ever happened to me. Talking to you made me smile and meeting you set me free. I can’t believe that fate is taking you away and ripping us apart. I just want to say that I will miss you from the bottom of my heart. Goodbye. Who will tolerate my annoying antics, who will calm me down when I am angry. Who will listen to my daily rants, who will make sure I am always happy. Who will I harass with my banter, who will I hang out with every day. I am sad and totally devastated, as my bestie goes away. Goodbye. Today I take a moment to thank Larry Page, Sergey Brin, Mark Zuckerberg, Jack Dorsey, Jan Koum, Brian Acton, Evan Spiegel, Robert Murphy and Steve Jobs. Without them we wouldn’t have Google, Facebook, Twitter, WhatsApp, Snapchat and FaceTime. How else would I have possibly kept in touch with you? Goodbye. Though the farewell of a best friend will be tearful but nowadays of modern technology where Facebook, Whatsapp and many more social apps can hold you together and hope your friendship will remain evergreen.